The bulk of the money is hidden in a budget line labeled “DOP Streetlight Program.” The Columbus Division of Police involved in public utilities and why is this hidden in the electricity and utilities section of the budget. Actual streetlights are now police equipment. The world leader in “intelligent” streetlights is General Electric. They make streetlights that are low power consumption LED lamps that turn themselves on and off as needed. They also have seismic sensors for footsteps, microphones and cameras built right in. This is most likely to be where the additional $5 million is going. The product is called CityIQ and incorporates wifi hotspots. This could have given every single person in the city free internet. If they were planning on this, they would have announced it. Instead the wifi hotspot will note the passing of every phone and this know who was where when. Also it could be used to selectively allow connections by phones in order to monitor people's communications as they walk down the street texting because they do not want to be overheard by the included microphones. Those microphones, which will be used ostensibly to detect gunfire, are most likely to be made by ShotSpotter, who is the industry leader and has installed their sensors to cover 450 square miles in 90 cities including Cincinnati. ShotSpotter lists GE as one of their partners and their devices are designed to be directly incorporated into GE's streetlights. Cincinnati. has spent $327,000 on the devices. Columbus is spending $1 million. Comparing the total area of both cities gives Cincinnati. a total cost of $4100 per square mile and Columbus a total cost of $4600. 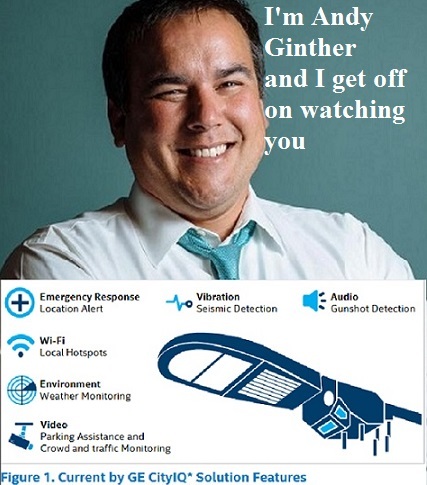 Mayor Ginther really wants to listen to what you say any time you are not in the City Council Chamber or voting booth. The listening devices are definitely strong enough to pick up a whisper on the street. The sound is fed to computers that use pattern recognition to determine the location of the shot and type of weapon. The signals processing incorporates the actual sound of a bullet traveling through the air automatically alert patrol units within 15 to 30 seconds. Shotspotter claims that all the recorded sound would only be stored “for a day or two” before being deleted, but this is a factor or storage capacity not the public's right to privacy while speaking to each other. This system can be accessed in real time or listened in on later at the whim of the police and the politicians that fail to fire them for their rampant brutality, which Columbus leads the nation in. Since cameras are also incorporated, they can also know who believes in human rights or won't be voting for the Mayor by going back over the footage. The cloud computing problem of storage can easily be solved by an industry leader in body cameras, Taser International. They supply body cameras which are used for roving surveillance and facial recognition and they also supply the online storage through their deal with Amazon. They have been a leader in dealing with law enforcement since the first time one of their devices was used to coerce a confession. Amazon built it's cloud computing capacity with a direct grant from the CIA. Taken together, this is a law enforcement package built to scale for Andy Ginther or any other garden variety third world dictator wanting to break into the 21st century with an innovative solution. The 2018 capital plan is huge and there are sure to be a great many more handouts for favored developers and other campaign contributors. This particular set of expenditures was designed to slip under the radar by hiding it's size, scope and even budget area. Mayor Ginther wants to know everything about you but he would prefer is you knew nothing about him.